Accessibility is an important attribute for every website, whether large and complex, or small and simple. A website that is accessible means it can be visited and used easily by everyone, including people with disabilities. It has certain built-in features that are designed to make it work better. Other features have been intentionally avoided or removed because they are known to be barriers to people with disabilities. A fully accessible website is one that meets the technical requirements outlined in the Web Content Accessibility Guidelines (WCAG), the world’s most widely used guidance for online accessibility. Currently, most regulations and policies make reference to Level AA of the 2.0 or the 2.1 version of WCAG. Accessibility is vital because there are more than a billion people with disabilities around the world, and they need to be able to use websites – to find information, do their jobs, pay their bills, organize their recreation time and run their businesses – just like everyone else. For those who don’t have extensive experience and training in web design, it can sometimes be difficult to conceptualize just what is meant by online accessibility. 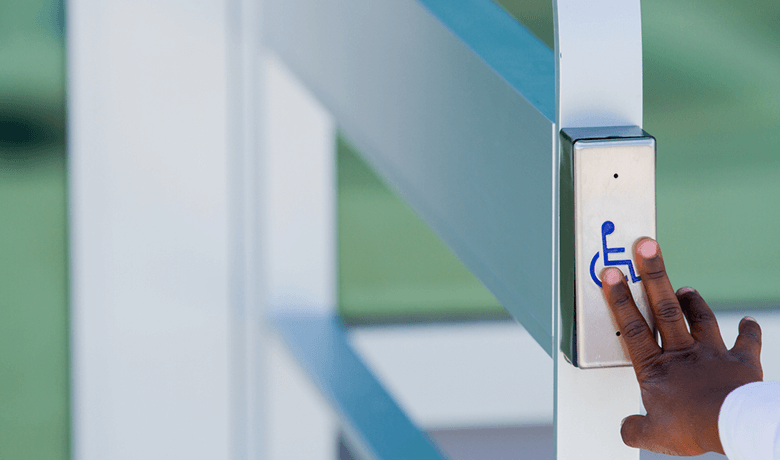 After all, it’s not something that can always be immediately seen – unlike certain accessible features of a physical space, such as ramps and elevators. Whether it’s a building or a website, people with disabilities must be able to get in, or their experience can’t even begin. For a physical space, an accessible entrance means there’s level access – not steps, stairs or a high curb – at the front door. There might be an automatic button to open the door, or a lever handle. The front door is wide enough to accommodate a wheelchair. Similarly, an accessible website has a home page or landing page that is welcoming and usable. The page has a title that explains its purpose or describes the topic. It can be navigated in proper sequential order – that is, when the user tabs their way through the page, the cursor doesn’t jump around to different sections nonsensically. WCAG 2.0 lists several criteria like these for making sure a website’s “entrance” is accessible. Once inside, access to goods and services should be considered. People with disabilities must be able to use all, not just some, of the facilities in a public space for it to be considered accessible. The Department of Justice suggests that organizations ensure their interior doors are easy enough to open without much hand dexterity, and that paths are clear of any obstacles that can’t be detected by a white cane. If there’s a cash counter, at least part of it should be lowered so that someone sitting in a wheelchair can interact with the cashier and pay for their purchases. In the same way, people with disabilities must be able to engage in all of the activities and features on a website. Photos and other images should have alternative text, so that people using screen readers can hear the images described. Videos should be properly captioned, so that people who are deaf can understand what’s being said. The forms people fill out to make purchases should accommodate slower typists – they must not “time out” too quickly, for instance. Many other criteria for building accessibility into these components of a website are included in WCAG 2.1. The “Checklist for Existing Facilities” includes some important guidance for accessible signage in a physical space. For instance, room numbers and permanent signs should be posted in Braille. Directional signs should be large enough, and in colors that contrast well, to enable people with low vision to see them. Emergency systems should include both sounds and lights so that people who can’t see or hear will be aware of an emergency. Signage is also quite important when building an accessible website, because it’s easy to get off track without proper directions! Several of the criteria in WCAG 2.1 have to do with headings, labels and other wayfinding. Descriptive section titles, for instance, let people know about the content of the next section. This means that people with low vision or who read slowly only have to read a few words to know what an entire section of the web page is about. And people using screen readers or who have difficulty using their hands can skip sections more easily, and go directly to sections that are more relevant. Hopefully this comparison helps you understand not only how web accessibility helps people with disabilities, but also how important it is. In the “How to Use this Checklist” section of the DOJ document, organizations are advised to evaluate their physical spaces, identify and list all barriers found, work with contractors to plan solutions, and take steps to remove barriers successfully and improve accessibility. The document also recommends that follow-ups be conducted regularly, and accessibility re-evaluated. These very same recommendations can be applied to improving the accessibility of a website. The only difference is that instead of reaching out to a building contractor holding a measuring tape or a toolbox, you’ll reach out to a web accessibility partner who has the expertise to help you identify barriers and plan solutions. Feel free to request a demo with eSSENTIAL Accessibility any time, if you’d like to learn more about partnering with us! In the meantime: whether you’re well into your accessibility journey or maybe you’re just getting started, be sure to check out our interactive WCAG 2.1 Checklist — a resource guide we created to help digital marketers and accessibility professionals alike make sure their websites are meeting accessibility standards.